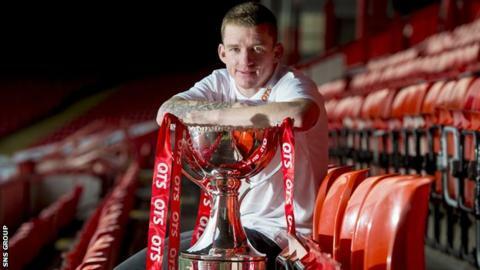 Ahead of Saturday's semi-final, Jonny Hayes is warning Dundee United that Aberdeen will fight all the way to hold on to the League Cup. "Everybody just wants to get more and more medals, more success," said the versatile Irishman. "It's the best feeling in the world. It's a feeling that you can't buy. "It's our League Cup crown and we want to defend it as well as we can and if we retain it, it would be a massive step forward for the club." Hayes, 27, missed last year's penalty shoot-out triumph over Inverness CT but played a key role in getting the Dons to the final, scoring twice in semi-final the win over St Johnstone. Some 40,000 fans travelled to Glasgow last March to witness Aberdeen lift their first trophy since 1995. And Hayes is pleased to deal with the anticipation from supporters that success brings. "It's a welcome expectation for myself," he explained. "It's enjoyable. A club of this stature should be where we are now, reaching semi-finals and challenging at the higher end of the league." Aberdeen are unbeaten in 10 games and sit just three points behind Premiership leaders Celtic. However, Dundee United are in close attendance - another three points adrift. United began this campaign with a 3-0 victory at Pittodrie but Aberdeen enjoyed revenge at Tannadice in December, winning 2-0. "We're in no doubts about how tough this game is going to be," explained Hayes. "The two teams have been evenly matched over the last 18-24 months. "This season, they beat us, we beat them. I'm sure they'll be fired up as much as we are. "Dundee United are renowned for their attacking play and if we can keep their front players quiet we'll give ourselves a great chance to win the game. "We also have good forwards that we can rely on. As long as we can keep it tight at the back, I'm confident they can get us goals." Hayes, who has played at left-back, left midfield and centre midfield this season, revealed the atmosphere at Pittodrie is low key compared to last term's cup run. "It's much more relaxed," he said. "I wouldn't say we were distracted last year but it was hard not to notice what was going on, with everyone getting excited about it. "Winning it last year was a monkey off the back for the club. "We've had a lot of games over Christmas and New Year, trying to pick up as many points as possible, and that has kept our focus on the league. "Now we get a break from the league. The manager is very good at directing our focus on each game; he did that particularly well last year. "It's not a case of 'we won a final, now we can relax' the manager is the same, he's the hungriest of everyone here."